Join us for bushels of fun and enjoy amazing activities for young and old alike! Your purchase of our Regular Wristband ($12.00) includes unlimited play at the bouncy pillow, sand pit, tumble bus, chalk bus, petting zoo, spider web, pony hop, barnyard football and baseball, tug of war, tic-tac-toe, apple checkers, pumpkin bowling, tire mountain, peddle carts, corn maze and corn hole. With your purchase of our Super Wristband ($20.00) you can enjoy all of the activities of the regular wristband PLUS access to some of our newest attractions! Your additional super wristband experiences include: gem mining, apple cannon (4 apples), One (1) ride on the busy bee train and One (1) small ice cream cone. While you are not required to purchase a wristband to accompany your child, any visitor over the age of 3 who will be enjoying our activities is required to purchase the appropriate wrist band. 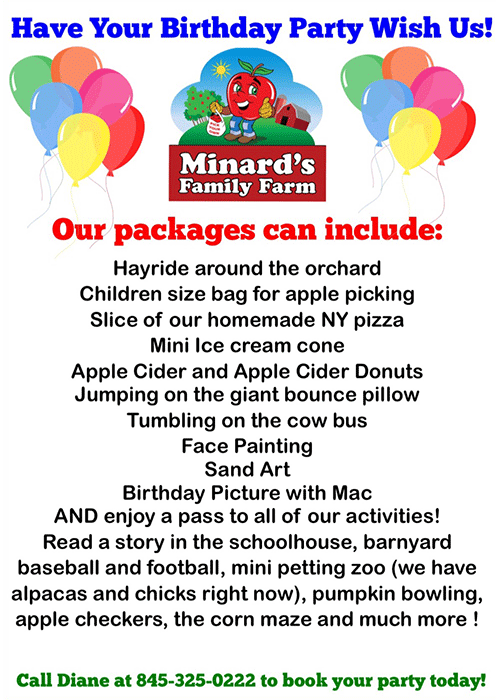 If you are visiting the farm and only wish to go apple picking, please visit our main barn to purchase your bags. No admission wristband is required to enjoy a ride on the wagon to pick apples in the fields.